There are many hidden expenses when it comes to traveling overseas. And one of them comes from the plastic in your wallet. Most credit cards charge a fee for making transactions in foreign currencies, an amount which is usually between 1 and 3% of your purchase price. Fortunately, one of the benefits of the Credit CARD Act has been to make these kinds of fees more transparent to consumers. So, at least now when you’re traveling, you should be aware of how much extra your charges are costing you, as any exchange fees should be broken out separately on your credit card statement. That’s not to say that you should avoid using your credit card while you’re on vacation. 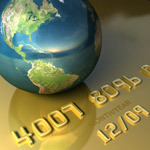 Charging your purchases to a travel credit card while you’re abroad does have a few very significant advantages. Among the most important is the convenience and security of not having to carry too much cash. And you may be pleased to find out that even if you are being charged a fee for using your card, you’ll still almost certainly come out ahead versus changing your money at the airport or hotel, since the exchange rates that credit cards use are quite competitive. Still, wouldn’t it be better to not be charged the fee at all? Fortunately there has been a trend towards offering this benefit on many cards, typically targeted to more affluent customers more likely to be frequent travelers. Please see each card’s terms and conditions for current rate and fee information. What about the exchange rate that is used? Several years back, I ran an experiment to compare the difference, if any, between the underlying exchange rates used by different networks, such as American Express and Visa/Mastercard. My goal was to determine whether the credit card companies were padding their profits by using favorable exchange rates, in addition to tacking on the foreign transaction fee surcharges. Ultimately, I concluded that, given how much freedom the networks had given themselves in terms of determining the conversion rate, everything looked reasonable. Instead, it was far more practical and productive to focus upon finding cards with the lowest advertised foreign transaction fees, such as those listed above. Nice Article. I believe the American Express Platinum card is the best card that does not have foreign transaction fees. I’ve been using it since 2004 and believe its the best travel card. I can’t believe you don’t mention a single CapitalOne credit card!!! They have the BEST deals. They have sign-on bonuses of up to $100.00!! They have no foreign transaction fees, and most cards have no annual fee. You can use your points as soon as you earned them – you don’t have to wait until the statement is ready!!! On top of all that, you can upload your favorite picture very 30 days – free of charge! The absolute best credit cards there is! Hi Gudrun, I suppose it’s easy to miss it since it’s only one line, but I did mention Capital One cards. (See the entry between Barclays and Chase.) I made the mistake of not bolding the heading initially, so perhaps that’s why you missed it. I’ve since added the bolded header. Thanks for the feedback. I’m looking for a Canadian Credit Card without annual fees or foreign transactions costs. Can you help with that? ?